Zara has its share of controversial trends stocked at any given time. It doesn't play it safe, and that's one of the many things we love about the brand. We're regularly on the lookout for new arrivals that shoppers will lose it over and that will subsequently sell out. Oftentimes, those trends are somewhat polarizing, and that's what makes them stand out. Speaking of, the latest denim trend that's sure to spark some strong reactions is one of the elastic-waist variety. Earlier this month, I pointed out that the elastic-waist jean trend had made a comeback on Net-a-Porter, which predicts plenty of denim trends each season. 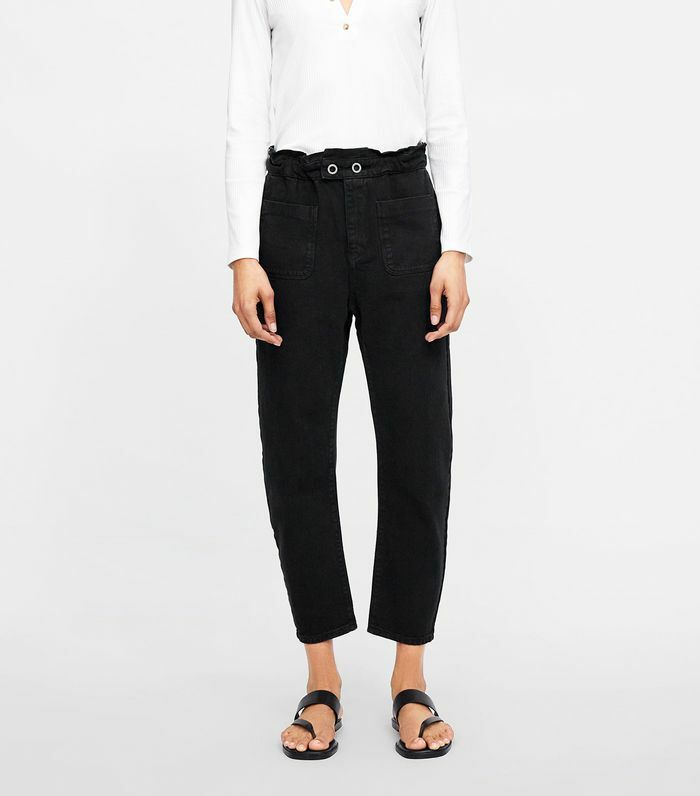 I've been on the lookout for more examples, and lo and behold, Zara just released its own take on the trend: Zara's feature a high waist, black wash, and a far-from-subtle elastic waist. Not only that, they also check the baggy-jean trend box and the comfort box. Oh, and they're $50. I'm predicting this combination will sell out quickly. Keep scrolling to shop the jeans, along with a few other controversial Zara pieces. Think bike shorts are too much? Now you have neon bike shorts to contend with. These may not be easy to walk in, but they'll certainly make you look taller. If you're not into the tie-dye trend, it's going to be a long season for you. Controversial shield sunglasses are replacing controversial tiny sunglasses. Culottes seem to be back—in pleated form. Open-toe ankle boots may not make much functional sense, but it is what it is. The chicest way to wear the neon trend. Ready or not, low-rise jeans are trying to make a comeback. Next up, the new Zara It shoes that sold out immediately.